SOUL FOOD FOR THE HUNGRY ADULT, 29th Sunday, OCT. 21, 2012. 29TH SUNDAY IN ORDINARY TIME, YEAR B: OCTOBER 21ST. 2012. See Home Page for Mass Readings for this Sunday. The Gospel is Mark 10:35-45. If you say something three times, maybe you mean it. If Jesus said something three times to the Twelve, in fairly quick succession, we can be sure he meant it. And if Mark included this three times in his Gospel, he too had a very good reason for it. Jesus three times (Mark 8, Mark 9, Mark 10) took the Twelve aside and told them very explicitly about his forthcoming passion and death,- about the handing over, the mockery, the scourging, and the putting to death. 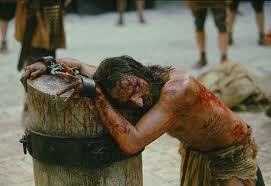 He was warning them that he was a different kind of ‘Messiah’,- a servant who would suffer greatly for his people. Mark tells us these three moments, because thirty five years or so after Jesus’ death, the followers of Jesus, for whom Mark was writing this ‘Gospel of Jesus Christ, Son of God’ (Mark1:1) were also facing and experiencing being arrested, mocked, tortured, and killed. If it happened to the Master, it would happen to them. But Jesus rose from death. And so would they experience glory, after their awful deaths, if the remained faithful to Jesus. Now, let’s come to today’s event: immediately after the third prophecy of the passion by Jesus (in verses 32-34), James and John, two of Jesus’ three closest circle (the other was Simon Peter), try to steal a march on the others of the Twelve. ‘In your kingdom, we want the seats on your right and your left!’ We want to be ‘the Greatest’! The two still didn’t have a clue about what Jesus was about. And Jesus tells them so! Again, the pair hadn’t a clue, but still they said Yes. And indeed, years later, they willingly did pour out their lives for the Master and for others, they did experience all the mockery and ridicule and suffering that went with being an Apostle of the Master. It took them years to learn it, or maybe they learned it when the Holy Spirit, the Spirit of Jesus, came upon them at Pentecost and they were filled with the Holy Spirit, with courage and boldness, even to the point of death. They learned eventually all that the Master meant about being ‘servant’ and ‘slave to all’, and that is where their ultimate greatness was found. And for any of us, today, the same paradox holds true: ‘anyone who wants to be great among you must be your servant, and anyone who wants to be First among you must be slave to all.’ That’s Jesus’ Upside-Down teaching for us;- we had some last week with the rich young man, we have it today with our brothers James and John, for whom it was a long time before the penny dropped. The Master suffered greatly. And so will his followers. The Master was servant to us all. And so will his true followers be. And we see it all around us, every day,- people of all ages gladly giving their energies, using their time and talents, in reaching out in love to people around them. We see it in young helping other young, in parents of small babies and children and teenagers giving unselfishly of themselves day in and day out. It’s all around us, in so many people. That’s how to be at ‘the right hand and the left hand’ of the Master, in this kingdom of each day. And every time we approach the altar to do as Jesus asked of us,- ‘Take this, this is my body given for you!’, ‘Take this, this is the chalice of my blood poured out for you!’ we are saying ‘Yes, we will!’ to Jesus asking us drink his cup, to share in his sufferings with him, to be steeped up to our necks in all that Jesus is about, to be servants of each other. Our receiving, and our AMEN! as we receive, is saying ‘YES, we are with you all the way, Lord!’ We are vowing ‘com-union’ with the Master in his life and death. Holy Spirit, open our eyes and hearts to grasp this. ← Letter to Sinead and Mark. October 21, 2012.